Molly Purves and Chris Brophy lead the cast of Richard III, performed by Shakespeare for the Masses. One of Shakespeare’s greatest villains, Richard III, has been the man audiences love to hate ever since his first hunchbacked appearance in the late 16th century. True to form, Chris Brophy played a sneering, scheming Richard with a spectacularly short fuse during last weekend’s performances by the Shakespeare for the Masses troupe. 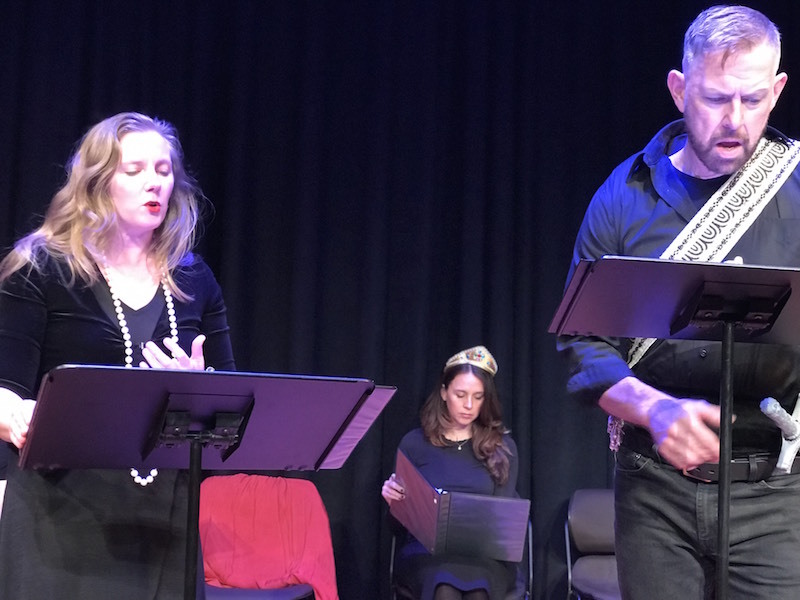 Within his first five minutes on stage at the Martha’s Vineyard Playhouse, Mr. Brophy murdered two narrators and two princes on his way to a body count that outnumbered the actors playing his victims. As abridged by dramaturges Nicole Galland and Chelsea McCarthy, Shakespeare’s second-longest play (after Hamlet) took just over an hour to see Richard journey from seething, sarcastic envy over his brother’s coronation (“Now is the winter of our discontent made glorious summer by this son of York”) to defeat and death on Bosworth Field (“My kingdom for a horse!”). This is the 11th year Ms. Galland and Ms. McCarthy have brought their “quick & painless & free” Shakespeare for the Masses to the playhouse. The two collaborators strip the plot down to its essence, and utilize a narrator to provide brisk, humorous updates on the action. The approach works because the directors cast strong performers in these roles. Chelsea McCarthy is not to proud to beg. At Sunday’s matinee, Ms. Galland earned laughs with lines like: “And with that, everyone awkwardly leaves.” But the humor did not detract from the emotional power of Shakespeare’s verse in Richard’s first soliloquy as Gloucester, or the dialogue with Lady Anne (Molly Purves) in which his powers of persuasion overwhelm the woman whose father and husband he has killed. 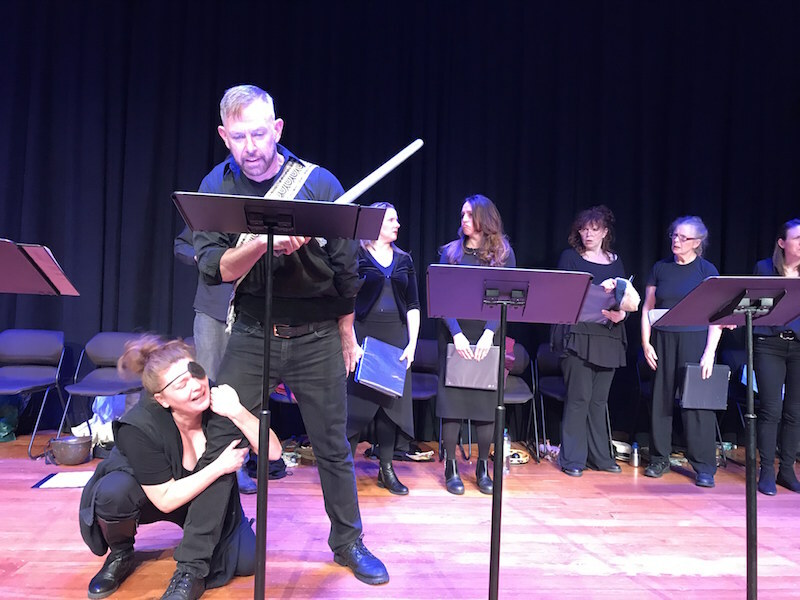 Along with Ms. Galland as narrator, eight actors portrayed more than a dozen named characters and several assassins, switching headgear and costume elements along with their roles. Richard’s unfortunate nephews were represented by teddy bears wrapped in blankets. When sent to the Tower of London, they were hung on a coat rack in a corner. With just one rehearsal before opening night Saturday, the cast remained on book with scripts on music stands. Nonetheless, things got active on stage more than once, as when actor after actor fell into a heap — several rising briefly to fall again — while Ms. Galland read a roll call of Richard’s victims. The final battle was also a lively scene. Ms. Purves donned a military cap and sword to play Henry, Earl of Richmond, who battled Richard at Bosworth and became King Henry VII. The rest of the cast shouted “Stab, stab, stab” as Richmond’s army overwhelmed Mr. Brophy, and the play was over. But Shakespeare wrote Richard III during the reign of Queen Elizabeth I, whose grandfather was Henry VII, the victor at Bosworth field. “It just goes to show, when you’re in charge, you can control the narrative,” Ms. Galland said.